You can select three different rearview camera angles for backing up. If there is no camera image on the display, go to Rearview camera image does not come on or work properly troubleshooting. Press the ENTER button to see if the rearview image changes between the wide view, the normal view, and the top down view in this order. Does the rearview camera image change properly? The failure is duplicated, go to step 2. Move the shift lever to P or N.
Check for continuity between test points 1 and 2. The CAMERA BIT0 and the CAMERA BIT1 wires are not shorted to ground. Go to step 3. 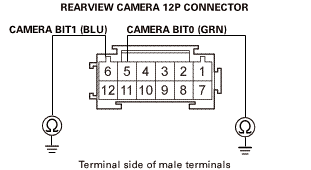 The CAMERA BIT0 and the CAMERA BIT1 wires are not shorted. Go to step 4. 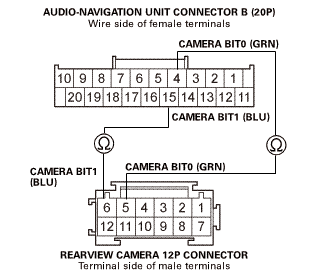 The CAMERA BIT0 and the CAMERA BIT1 wires are OK. Go to step 5. Substitute a known-good rearview camera, and recheck. Does the symptom go away?